A short story collection about the childhood of a single character, Del Jordan, as she is growing up in a small Canadian town. I sense a running theme among my favorite books. Same as The Martian Chronicles, Lives of Girls and Women claims to be a short story collection, but reads more like a series of vignettes illustrating the same girl's childhood. It was a surprisingly sobering look at the lifestyle, with tales ranging from surreal comedy to subtly disturbing, to outright leaving me speechless. 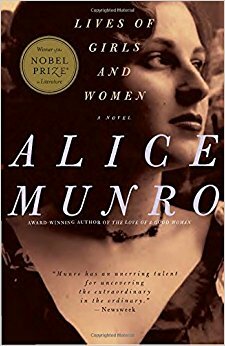 Alice Munro draws you in with her storytelling, giving Del Jordan such a compelling and realistic voice that it only made the stories more amazing. Honestly I haven't read much of Munro's work thus far, but after this one I'm planning on adding her to my permanent reading list.